End cross fin tube is a tube having integral external fins of 26 to 40 fins per inch and increased fin height with a trapezoidal shape. These fin tubes are produced with smooth bore as well as integral internal ridges. End Cross Fin Tubes are generally used in Vapour Absorption Chillers. These fin tubes are available in 12.7 mm, 15.87 mm & 19.05 mm outer diameters with wall thickness as low as 0.55 mm. 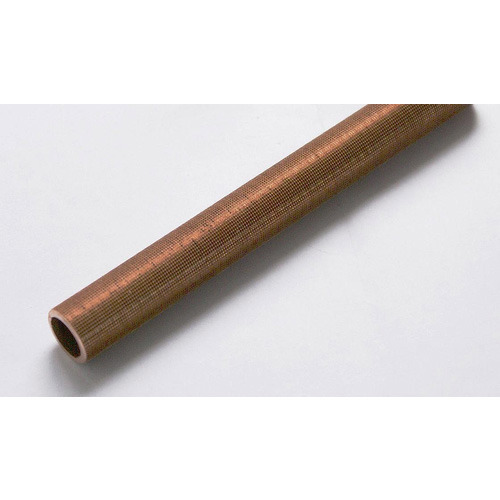 These fin tubes can be fabricated from all types of Copper & Copper Alloy Tube products. It is also known as Knurled Fin Tube. be fabricated with intermediate landings upon specific request.